Why work for your money when there are Red Dead Redemption 2 treasure maps that just deliver fat wads of cash to your pocket. Okay, you might have to take a little walk and find where these stashes are hidden, but with our guides it'll a lot quicker and safer than trying to rob your way to fame and fortune in Red Dead Redemption 2. We've collected together a quick guide and video for each of the three Red Dead Redemption 2 treasure maps here, to make your gold bar collecting as easy as it can possibly be. So no looking at pictures of trees and trying to work it all out, just get to the point and, more importantly, all that lovely money. 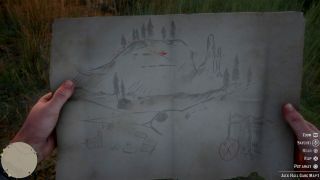 The Jack Hall Gang treasure map is one of the first you can obtain in the game, once you've set up camp at the start of Chapter 2. To acquire it, head to the top of the hill west of Flatneck Station near Bard's Crossing, where you'll meet Máximo Cristóbal Valdespino. This seasoned explorer will offer to sell you a map for $10, so purchase it then follow our complete Red Dead Redemption 2 Jack Hall Gang treasure map guide to add another two gold bars to your stash. To get started with the High Stakes treasure, you need to look out for a random encounter with a scruffy fellow, who you'll find surrounded by maps in a random location somewhere in New Hanover or near Strawberry in West Virginia. He'll stash one of these when you approach, then try to do a runner with it - so either shoot or hogtie him then loot this particular map from his body. Follow our complete Red Dead Redemption 2 High Stakes treasure map guide to track down three shiny gold bars as your reward. To initiate the Poisonous Trail treasure hunt, one of the most lucrative in the game, you'll need to wrap up warm and head to Cairn Lake in northwest Ambarino - a place you may already recognise as one of the Red Dead Redemption 2 Gunslingers locations. Inside the cabin belonging to Flaco Hernandez, you find a map in a lock box under the bed - grab it then follow our complete Red Dead Redemption 2 Poisonous Trail treasure map guide to lead you to a cave system hiding a whopping four gold bars inside. So, can't decide what to spend all your new-found wealth on? These are the best Red Dead Redemption 2 weapons you can get.